Veterans Affairs Dept. buys one out of every five hearing aids sold annually in the U.S.
Is the Veterans Affairs Dept. too stringent on veteran-owned companies? You can find more reporting on the problems facing post 9/11 veterans from News21 here. We’ll also publish a new story on our website daily through Sept. 6. Toward the end of his Iraq tour, the now-retired staff sergeant said he realized his hearing had gone bad. “I found myself telling others, ‘Wear some ear protection so you don’t go deaf like me,’” he said. 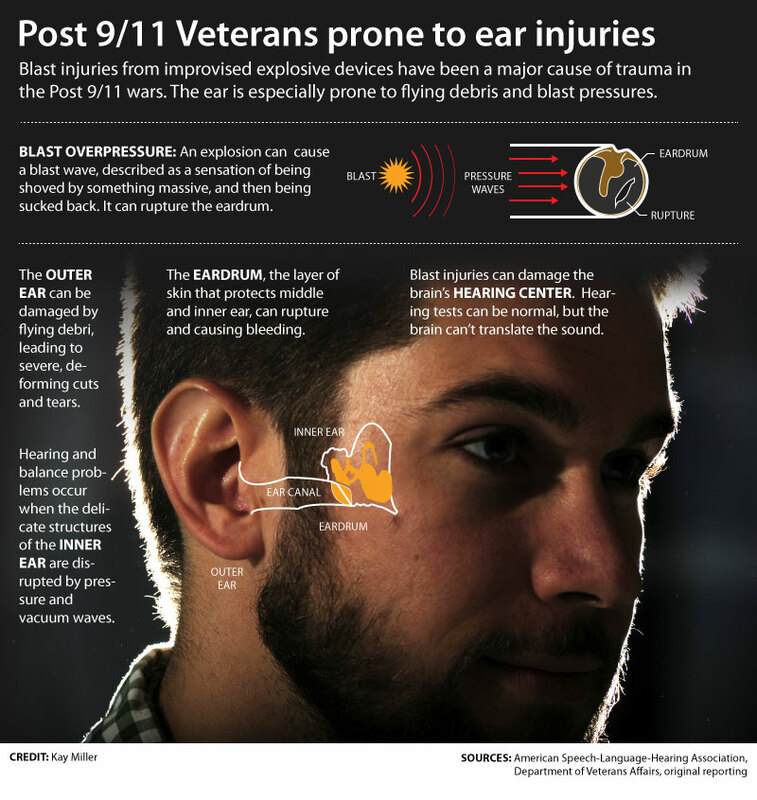 Among post-9/11 veterans, 414,000 have come home with hearing loss and tinnitus, or ringing in the ears. The most-widespread injury for veterans has been hearing loss and other auditory complications, according to interviews and benefits data. Hearing maladies cost more than $1.4 billion in veterans disability payments annually, according to fiscal year 2010 data from the Hearing Center of Excellence, a part of the Department of Defense. At least $216 million was spent that same year for hearing aids and related devices, according to an advisory committee report to the VA.
Paying an average of $348.15 each, the VA buys one in five hearing aids sold annually in the U.S., according to that 2010 spending report, the last year that data was available. Hearing injuries are the most commonly documented trauma, said Forbes, a Marine veteran who has a doctorate in audiology and served during the Gulf War/Somalia conflicts. He has been a VA audiologist for 13 years. The most common disability among all veterans is hearing related, according to a January 2011 Government Accountability Office report. Despite being such a prevalent condition, hearing problems don’t get much attention, because “in general, very few people die because of hearing loss,” said Theresa Schulz, a retired Air Force audiologist who now works in a similar capacity for Honeywell Safety Products. Rep. Dan Benishek, R-Mich., chairman of the Subcommittee on Health of the House Veterans Affairs Committee, said in a telephone interview that 25 to 30 percent of VA disability claims involved hearing. Among them, “almost 99 percent” eventually are approved, he said. Benishek, who is a physician, has proposed that every service member gets a full audiology examination at discharge. His bills have been sent to the Congressional Budget Office to determine their impact on federal spending. Shortly after his discharge, Mota was with his family at a mall when he stopped at a hearing professional’s office to get tested. Immediately, he was fitted with his first two hearing aids. Last year at a Marine Corps ball, he noticed that many of his buddies seemed to have trouble hearing, too. Master Sgt. Charles Peworski’s last hearing test was in 2004 despite the fact that he knows his hearing is a problem. When he and his fellow reservists gather to celebrate the Marine Corps anniversary, they joke about their hearing, or rather, the lack of it. “We laugh about it. Out of the 10 guys in my unit, when we get together we say, ‘You know I can’t hear … talk to my good ear,” he said. If there is a good ear. One of his Marine buddies wears hearing aids in both ears; necessary, he said, because of noise exposure over his career. Peworski was exposed to several factors that cause hearing impairment for military personnel: loud noises from trucks and helicopters, as well as machine-gun bursts and artillery fire. In October 2008, Congress mandated a Pentagon-based office that would determine ways to prevent, diagnose, mitigate, treat, rehabilitate and research hearing loss and auditory issues for active-duty service members and veterans. Experts say too few returning veterans, like most people, don’t seek medical attention for their hearing loss when they first notice it. They just live with it. “We know that it is usually seven years between the time someone notes a problem with their hearing and the time they actually seek medical attention for it,” said Nancy Macklin, director of events and marketing for the Hearing Loss Association of America. Prolonged excessive noise damages hearing, according to the National Institute of Deafness and Other Communication Disorders (NIDCD), a division of the National Institutes of Health. Loud noises destroy the ear’s special cells, called “hair cells.” The ear cannot grow new hair cells. Loud noises also damage the auditory nerve, another hearing component that helps translate sound waves into signals the brain understands. Hearing also can be damaged significantly by a single impulse sound — gunfire, for example. Normal conversation is considered to be “safe” at a sound level of 60 decibels, according to the NIDCD. On flight decks, noise levels are around 130 decibels and helicopter noise is around 100 decibels, according to military noise assessment. A soldier near an M60 machine gun is exposed to 150 decibels and within 50 feet of an exploding grenade, 160 decibels. Blast pressure also damages hearing. Eardrums can rupture at pressure as low as 5 pounds per square inch, a fraction of what it takes to damage internal organs. Explosives used in Iraq and Afghanistan create pressure that exceeds 60 psi, according to VA audiology research. The pressure that damages lungs and intestines is 56-76 psi. Another feature of blast injury/hearing impairment is that it likely will show up later, often as part of blast-induced traumatic brain injury. Brett Buchanan, an Army veteran, is a claims agent for Allsup, a Belleville, Ill.-based national disability representation company that helps veterans through their medical appeals. If veterans wait seven years, Buchanan said, their time discharged might be longer than the time they served on active duty. Upon discharge, veterans should get a baseline audiology examination, he said. “Ultimately when the VA adjudicator looks at your claim and sees that you entered at this hearing threshold and left at this hearing threshold, and that every year after discharge your hearing has gotten progressively worse even though you were working in an office environment, it just lends credibility to your case that the hearing loss you experience today is due to that noise exposure in service,” Buchanan said. Post-9/11 veteran Mark Brogan uses a CapTel phone, which allows him to read a transcription of a conversation while someone is talking to him, because of his hearing loss. Brogan lost most of his hearing when a suicide bomber detonated behind him during a mission in Iraq in 2006. The CapTel phone transcribes what the person on the phone is saying, allowing a hearing-impaired user to see and read the phone conversation. Mark Brogan had his right temporal lobe removed because of the damage he suffered as a result of the suicide bomb. Retired Army Capt. Mark A. Brogan was severely wounded in Iraq when a suicide bomb attack blew away part of his skull. Beyond his surviving that 2006 blast, Brogan said he is amazed by how much his hearing-assistive devices improved his life. Brogan uses a device called CapTel lets him hear and read a transcription of telephone conversations as he listens to them. “I had to find ways to re-engage and I just happened to discover a local HLAA (Hearing Loss Association of America) chapter,” Brogan said by phone from his Knoxville, Tenn., home. After speaking at an association convention, he now is invited to speak on many speaking panels, for organizations such as the HLAA and the Veterans of Foreign Wars. Army Col. Vickie Tuten, associate director for the Hearing Center of Excellence, and Kyle Dennis, the VA representative to the center, work together to assure veterans’ well-being.